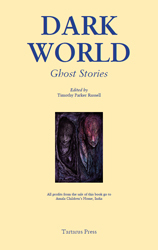 All profits from Dark World, the new collection of ghost stories, will be used to help the Amala Children’s Home, funding a three-week working trip in July 2013, and being donated directly to the cause. Located in the Tamil Nadu region of India, the home provides accommodation, food, safety and schooling for orphans and severely disadvantaged children. Without it, the children would be living on the streets of India, with all the immense hardships and dangers that brings. Included in the book are fourteen stories from around the world. There is an intriguing story from Jayaprakash Satyamurthy set in Bangalore and Dubai, my tale about an Indian palace, the excellent Reggie Oliver’s “Come Into My Parlour”, Stephen Holman’s unsettling story in a Los Angeles arts academy, Anna Taborska’s mix of old legends and the present day in Eastern Europe, and Mark Valentine’s mystery in Northamptonshire. Rosalie Parker’s “Oracle” takes place in the Yorkshire Dales.Many of the stories use their locations to capture ghostly feelings. You buy the book – Tim does the work in India. And because Tartarus has published it, the package is attractive. Sounds like a win-win to me, which is why I got involved. This sounds very intriguing and refreshingly different. However the mention of India and ghost story reminded me of a strange movie from the 70s, I think was called; Ghost Story. It was an odd period piece but what was really weird was it starred Murray Melvin, Marriage Faithful and Penelope Keith?